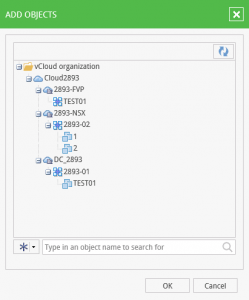 Sneak Peek - Veeam 9.5 vCloud Director Self Service Portal - VIRTUALIZATION IS LIFE! 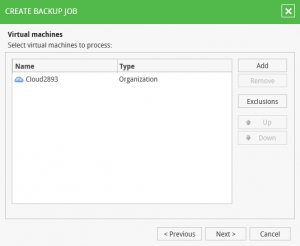 Last month Veeam announced that they had significantly enhanced the capabilities around the backup and recovery of vCloud Director. This will give vCloud Air Network Service Providers the ability to tap into a new set of RESTful APIs that adds tenanted, self service capabilities and be able to offer a more complete service that is totally controlled and managed by the vCloud tenant. 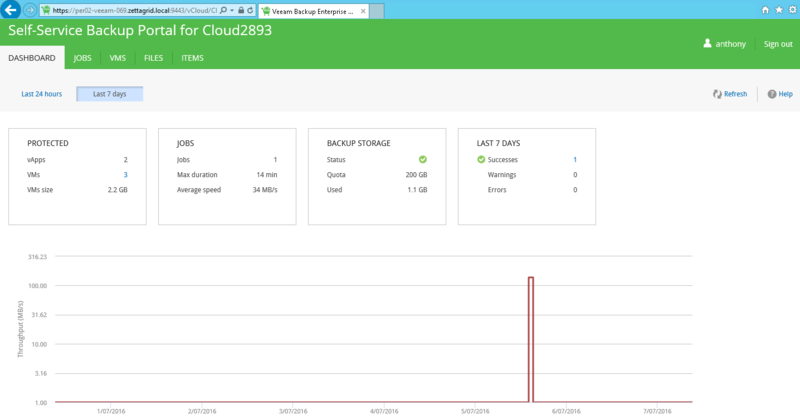 As part of the Veeam Vanguard program, I have been given access to an early beta of Veeam v9.5 and have had a chance to take the new functionality for a spin. Given the fact this is an very early beta of v9.5 I was surprised to see that the installation and configuration of the vCloud Director Self Service functionality was straight forward and like most things with Veeam…It just worked. NOTE: The following is based on an early access BETA and as such features, functions and menu items are subject to change. The new vCloud Director integration lets you back up and restore single VMs, vApps, Organization vDC and whole Organization. This is all done via a web UI based on Veeam Backup Enterprise Manager. Only vCD SP versions are compatible with the feature. Tenants have access to Self-Service web portal where they can manage their vCloud Director jobs, as well as restore VMs, files and application items within their vCloud Director organization. 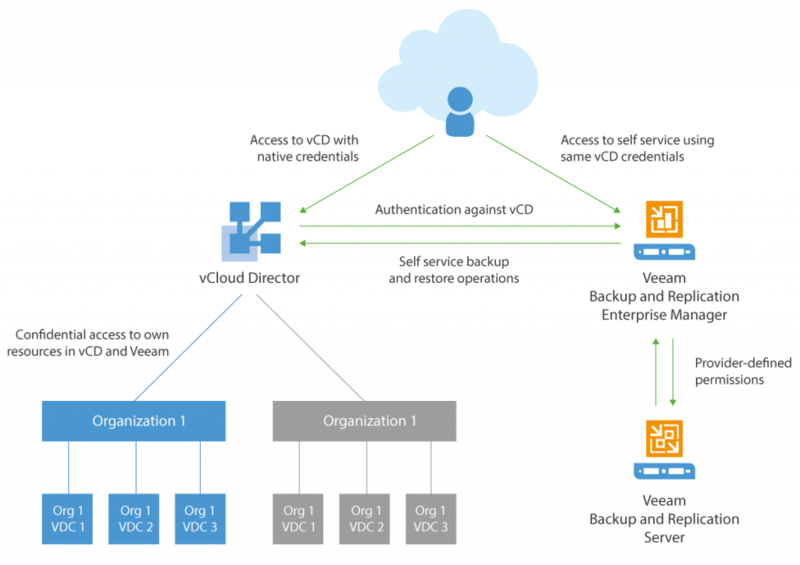 As shown in the diagram below Enterprise Manager than talks to the vCloud Director Cells to authenticate the tenant and retrieve information relating to the tenant vCloud Organization. 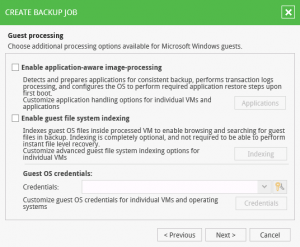 Anyone who is familiar with Veeam will recognize the steps below and the familiar look of the menu options that the Self Service Portal provides. As shown below the landing page once the tenant has authenticated is similar to what you see when logging into Enterprise Manager…in fact the beauty of this portal is that Veeam didn’t have to reinvent the wheel…they just retrofited vCD multi-tenancy into the views. To configure a job click on the the Jobs Tab and hit the Create Button. Give the Job a Name and set the number of restore points to keep. Next select the VMs you want to add to the Job. As mentioned above you can add the whole Org, vDC, vApp and as granular as per VM. Next select any Guest Processing you want done for Application Aware backups. And then set the Job Schedule to you liking. Once that has been done you have the option to Run the Job manually or wait for the schedule to kick in. 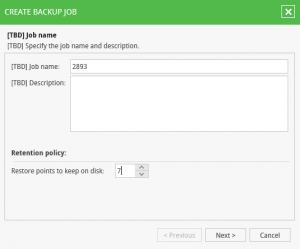 As you can see below you have a lot of control over the backup job and you can even start Active Full Jobs. 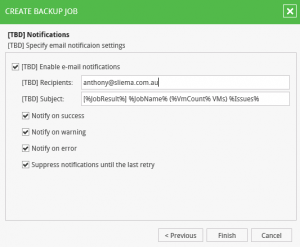 Once a job has been triggered you have access to view logs on what is happening during the backup process. 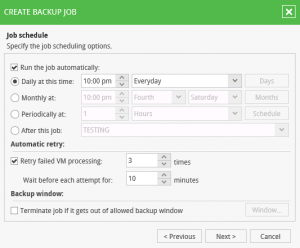 The details is just as you would expect from the Veeam Backup & Recovery Console and keeps tenant’s informed as to the status of their jobs. There is a lot more that I could post but for the moment I will leave you all with that first sneak peak. 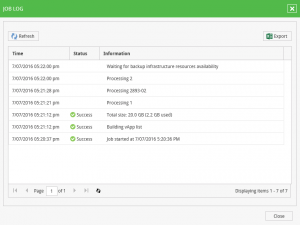 Once again Veeam have come to the party in a big way with this feature and every service provider who run vCloud Director should be looking at Veeam 9.5 so as to enhance the value of their IaaS offering. I have tried to use the “VMWARE VCLOUD DIRECTOR” Wizard with that URL (and xxxxxxx.com as DNS name) without succes. Is this the correct Wizard or is there another one for the “Self-service” portal? I have tried to adapt the URL to the format and port 9443 (instead of 443) without success again (same error message “vCloud director server is not accessible”). Is there a way to distinguish if it´s a network error? I´m doing it from a VMware win7 guest behind NAT with a zScaler web proxy to access internet, as the server is in internet. Is port 9443 mandatory?